John and Jennifer (Jen) are 62 and want to retire comfortably soon. Can they retire now? They want to know how to set up their retirement income to give them the maximum income that will be reliable for the rest of their life. They have been investing for years and have R10 million in retirement investments. Is that enough? They make an income of R1 000,000 per year and are scared to stop working and give it up. 70% Replacement ratio: They will need R700,000 per year income in retirement. Based on the “replacement ratio” rule of thumb, they will need 70% of their pre-retirement income. 4% Rule: They can withdraw R400,000 per year and increase it every year by inflation from their R10 million in investments, based on the “4% Rule”. Add roughly R300,000 from CPP and OAS to give them the R700,000 per year they need, so they have enough. Age rule: They are getting older so they should invest more conservatively based on the “Age Rule”. The should invest 100 minus their age in stocks. Since they are age 62, they should have 38% in stocks and 62% in bonds. Sequence of returns: They should invest conservatively because they can’t afford to take a loss. They could run out of money because of the “sequence of returns”. If they would have investment losses early in their retirement, their investments would not recover. Delay CPP to age 65: They were told this is a “guaranteed return of 7.2% per year”, because they will get 7.2% more for each year they wait. 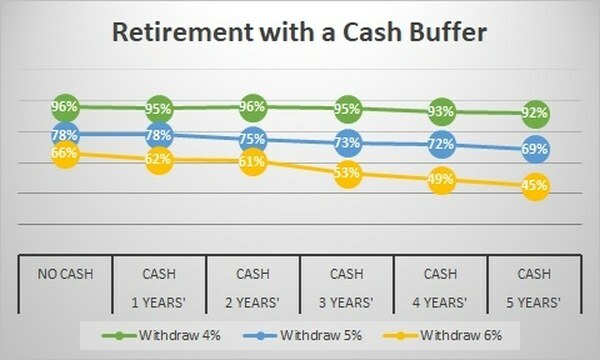 Cash buffer: They should keep cash on hand equal to 2 years of their income from their investments to draw on when their investments are down. Since they could withdraw R400,000 per year from their investments, they should keep R800,000 of their investments in cash. John & Jen came to see me because they were still hesitant to quit their jobs. They said this advice is from rules of thumb and not specifically for them. You need a personalized Retirement Plan. Don’t base your future on rules of thumb. John & Jen want a relatively comfortable retirement. They enjoy dining out and golf, want 2 reliable cars, and R100,000 per year for vacations. After we worked out their desired lifestyle in detail, they were surprised to find that they actually need R800,000 per year (R400,000 each before tax) to live the lifestyle they want. I told them the 70% replacement ratio rule of thumb might be a reasonable average, but everyone is different. I have prepared Retirement Plans with as low as 45% and as high as 150% of preretirement income. Decide on the life you want to live. Don’t settle for the income you get. John and Jen’s investments now are two equity funds and two balanced funds. They have 75% in equities and 25% in bonds. I asked how they felt about this mix. They said they had owned them for years and are comfortable with this risk level. They owned them in the crash in 2008 and did not sell. I told them they have a long-term time horizon and history does not support a safer retirement from investing more conservatively. They should invest based on their risk tolerance, not based on how they think they should invest. Their time horizon is long. They are 62. In 50% of Canadian couples in their 60s, at least one of them makes it to age 94. Planning for their money to last until age 94 would be a 50% chance of running out of money. It would be better for them to plan for no more than a 25% chance of outliving their money. There is a 25% chance that one of them will live to age 98. That means John and Jen have a 36-year time horizon, which is definitely long-term. We had a detailed discussion of their risk tolerance. They confirmed they are comfortable with their existing investment risk. They would stay invested even in a large market decline. We decided to keep their investments at 75% in stocks and 25% in bonds. A target withdrawal rate can be an effective way to manage your retirement income after you retire, but 4% is not reliable for most seniors. I told them that, based on history, the “4% Rule” was safe for equity-focused investors, but not for most seniors. 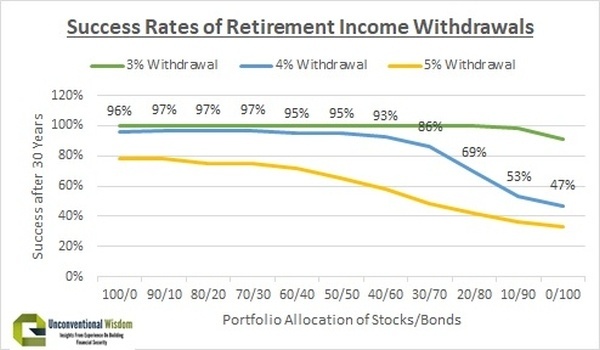 In the image below, the blue line is the “4% Rule”, showing how often in the last 146 years a 4% withdrawal plus inflation provided a reliable income for 30 years with different portfolio allocations. I explained that the “4% Rule” worked only if you invest with a minimum of 50% in stocks. Even safer is 70-100% in stocks. It is best to avoid a success rate below 95% or 97%. They mean a 1 in 20 or 1 in 30 chance of running out of money during your retirement. I asked John and Jen how they felt about a 1 in 20 chance (95% success rate) of running out of money. They said a 1 in 30 chance felt better. Most seniors invest more conservatively and the 4% Rule failed miserably for them. A “3% Rule” has been reliable in history (green line), but means you only get R300,000 per year plus inflation from a R10 million portfolio, instead of R400,000 per year. Based on the “Age Rule” of thumb, John and Jen had been advised to invest 62% in bonds and increasing that by 1% every year. In a 36-year retirement from age 62 to 98, they would average 80% in bonds. Since we had decided on 75% in stocks and 25% in bonds, the 4% Rule is reliable for them. It has worked 97% of the time in history. Yes. To understand this, it is important to understand that stocks are risky short-term, but reliable long-term. Bonds are reliable short-term, but can be risky long-term. Why? Bonds get killed by inflation or rising interest rates. If either happens during your retirement, you can easily run out of money with bonds. The next chart illustrates this clearly. It shows the standard deviation (measure of risk) of stocks, bonds and cash over various time periods in the last 200 years. 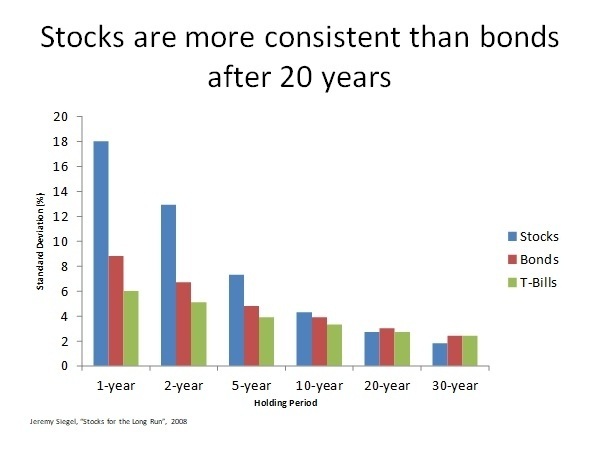 Note that stocks are much riskier short-term, but actually lower risk for periods of time longer than 20 years. After seeing the history, John & Jen finally felt comfortable with a 4% target withdrawal rate for them, since they plan to maintain their 75% allocation to stocks. I told them the “sequence of returns” is not supported at all by history. Retirement is long and stocks have almost always recovered any loss throughout history – even when you continue to withdraw your retirement income from them. I showed them the charts below, based on US market history data since 1871 from Standard & Poors, Barclays and Bureau of Labour Statistics, which show actual history of the 4% Rule with 3 different investment allocations. Each line is a 30-year retirement. To see how successful retirement would have been, note how often the lines go below R0. With 100% in equities, the success rate was 97%. There are 118 retirements of 30 years on this graph. Investing 100% in stocks, you would have run out of money only 5 times – 4 because of very high inflation and one because of a market crash. Notice that there was a market recovery within a few years of almost all market declines, even though you continued with the same retirement income and increased it every year by inflation. There were quite a few market crashes in the last 146 years, but only once would you have run out of money because of a market crash (retiring in 1929). In other words, the sequence of returns was an issue only once in the last 146 years. Most seniors invest more conservatively, such as with 70% bonds and 30% stocks. Their success rate was 86%. The data below shows that they would have run out of money 17 times. Because of the “sequence of returns”, the typical advice is to invest more conservatively with more bonds. This is not safer! The risk of running out of money with 70% in bonds is 3 ½ times higher than with 25% in bonds. I explained to John and Jen that delaying CPP is not a “guaranteed rate of return of 7.2%”. They get 7.2% more CPP during their life and then their spouse gets 60% of that if the spouse outlives them. The rate of return depends on each specific situation but is closer to 5%. Whether to take CPP early or delay it depends on many factors. I showed them my studies of “Should I start my CPP early?” and “Should I Delay CPP & OAS Until Age 70?“. They showed that how you invest is one of the main factors. In general, equity investors should take CPP earlier, while balanced and bond investors should delay it. Now that I know their situation, I recommended to John and Jen to start their CPP at retirement. John and Jen asked whether they should hold cash equal to 2 years’ withdrawals to draw on when your investments are down. Then they could live off the cash and not touch their investments after a big down year, giving them some time to recover. The study showed that holding cash does not protect you. In fact, it often increases your risk of running out of money. The drag on your returns from holding cash sometimes caused you to run out of money, but holding cash never protected you from running out of money. This might be counter-intuitive. The reason is that retirement is long – say 30 years. Stocks usually recover from declines. Holding cash for 30 years means you lose out on a lot of income, plus the loss of purchasing power due to inflation. In addition, if you hold cash, you will almost definitely die with a significantly smaller estate to pass on to your loved ones. We created a proper retirement plan. Instead of using rules of thumb to estimate how much they might need, we used retirement planning software. I showed John & Jen that they need R10.15 million in retirement investments to have the retirement they want. They are 15% short. Retire now at age 62 on R730,000. We discussed what lifestyle expenses they would cut R70,000/year. They could buy R200,000 cars instead of R300,000 cars and cut their travel from R100,000 to R60,000 per year. Work 1 ½ years and retire at 63 ½ on their desired $80,000 per year. Retire now on R800,000 with an advance retirement income strategy. There are many ways to manage your retirement income. My study found methods that had 100% success in history with withdrawal rates of 5% and even 6% of your investments if you manage your withdrawals effectively and can take a small decrease in some circumstances. You should be careful with these higher methods. They require carefully managing your income. John and Jen prefer option B, to retire on their desired lifestyle. They realized from this process that they are not fully ready to retire today. They now have confidence they can retire in about 1 ½ years. What is the best way to set up your retirement income to give you the maximum income with the lowest risk of running out of money? Get your Retirement Plan. Plan your desired retirement. Work it out in detail so you are confident. Don’t use an “income replacement ratio”. Decide on the life you want to live. Don’t settle for the income you get. Equities are safer. Don’t assume you need to invest more conservatively just because you are retired. Retirement is for 30+ years. Consider keeping the same allocation you had before retiring. Equities are also taxed at much lower rates than bonds and GICs. You need cash flow, not income. Invest for long-term total return and then withdraw the cash flow you need. Don’t focus on income, like interest or dividends, if they would reduce your long-term total return. Systematic withdrawals (or “self-made dividends“) give you control and are the lowest taxed investment income. Equity investors can safely use the 4% Rule, as long as you invest at least 50-70% in equities. The “Age Rule” works with a “3% Rule”. There is nothing wrong with investing conservatively with the Age Rule, but then reduce your retirement income to withdraw only 3% of your investments each year. Fixed income is lower income. The more conservatively you invest, the lower your retirement income should be. Don’t worry about the “sequence of returns”. Worrying about it can lead you to hold more in bonds, which actually increases your risk of running out of money. Retirement is long and stocks have reliably bounced back in history. Be smart about your risk tolerance. Invest with the highest amount in stocks that is within your risk tolerance. That means you cannot make the “Big Mistake” – sell or invest more conservatively because of a market decline. The more conservatively you invest, the more likely you will run out of money (at any withdrawal amount). Get educated on stock and bond market history, so you have an accurate picture of risks and returns. Inflation is huge. Inflation typically makes the cost of living triple during your retirement. You need a rising income, not a fixed income. Inflation kills bonds, but not stocks. It is safer NOT to hold cash. Holding cash does not protect you and may increase your risk of running out of money. It almost definitely means you die with a smaller estate. Higher income is possible with effective management. You can have a higher income by withdrawing 5% or even 6% of your investments if you can manage your income effectively or are working with a financial planner who knows how to manage it effectively. Thank you Ed Rrempel for your insight.